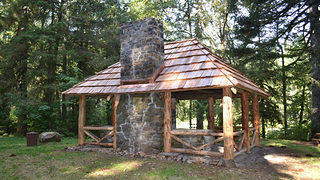 The restored Hebo Lake community kitchen looks much like it did in 1937. The historical legacy of the Great Depression includes everything from federal programs such as Social Security to transportation landmarks such as New York’s Triborough Bridge (now called the Robert F. Kennedy Bridge). But some of the most distinctive reminders of that time are the work of the Civilian Conservation Corps (CCC). Between 1933 and 1942, the CCC put millions of unemployed men to work on infrastructure projects, many of them in the country’s national parks and forests, where they built the simple structures and rough amenities that have helped define the camping experience for Americans ever since. During the summer of 2016, the U.S. Forest Service rescued one small part of its CCC inheritance, an open-air community kitchen at the Hebo Lake Campground in western Oregon’s Siuslaw National Forest. After some eight decades of service, the log-framed, National Register–eligible building needed a total restoration, says Forest Service archaeologist Kevin Bruce. Fortunately, he adds, “we had some early photographs from the late 1930s, when they had just built the community kitchen,” to guide the work. 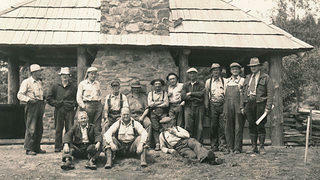 The Resettlement Administration work crew that built the structure posing in front of the stone chimney in 1937. Bruce collaborated with a Denver-based nonprofit called HistoriCorps to recruit, train, and lead volunteers during four weeklong restoration sessions. This latter-day conservation corps disassembled and replaced most of the wooden structure and its cedar-shake roof. The project also restored the stone floor, fireplace, and chimney, filling masonry joints with period-correct mortar and replacing lost or broken stones with ones from the same quarry as the original materials. A local welder fabricated metal cooktops for the distinctive wood-fired stone cook stoves that flank the central fireplace. Bruce D. Snider is an architect, writer, and editor based in Belfast, Maine.